Day 4 (Sat): I'm up early and start dragging more stuff to the boat. It's sunny, so we come off shore power and run on solar power all day, including an evening "Big Bang Theory," mini-marathon. (Yes, we also get local TV, thanks the previous owner's mast antenna). The Captain finishes removing the old name off the stern and other side of the boat and adds the new decals (standing in a dinghy in 20 kts of wind with a heat gun. Looks like a good core workout). 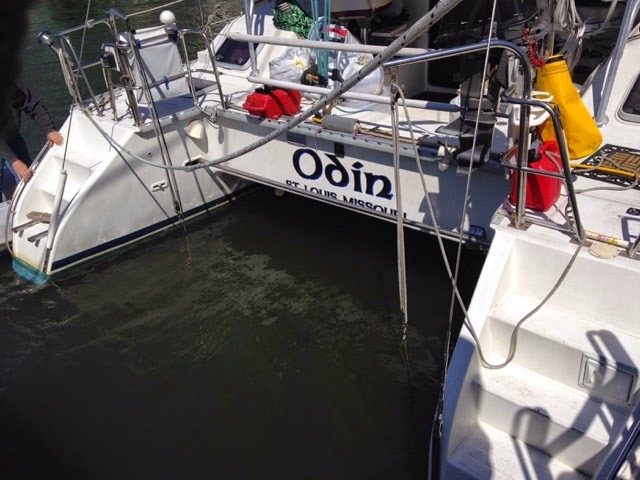 We are officially "Odin." He gets the dinghy engine running and decides "it's time to have some fun". I call it brave. I'll wait here. It's still windy and he heads out into the current instead of staying close to the marina. It floats and runs (almost all the way) back to the boat. 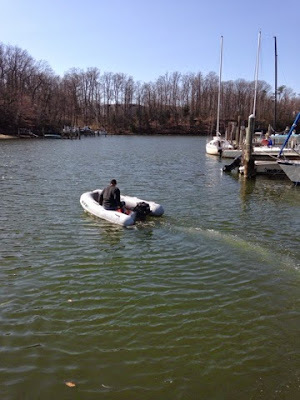 He changes oil on the right engine and works on the dinghy engine ("Does this look like the youtube video?"). I have almost everything on the boat (and it's not FULL or below the water line yet!) Still wiping out cabinets and unloading. I've never been this domestic. I line drawers on the nav station side with contact paper. You read that right. CONTACT PAPER. Never done that in my life! Day 5 (Easter Sunday): You'd think it would be quiet at a marina on the morning of Easter Sunday. We were hoping to do some of the standing rigging while no one was around. However, a boat broker and his customers show up at 8:30 am to look at the power boat next to us. Dang it. Then it there was frost on deck. We finally got both lower stays swapped out. They look pretty! Two lady rowers came in as we finished and we chatted--me from the top of the mast, about the Volvo Ocean Race and all-women's team. 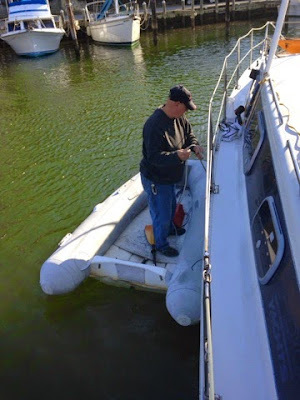 The Captain installed two more fire extinguishers, made a rack for more storage in the port aft locker (to avoid anything falling into the steering) and played with the dinghy engine some more (he got out the manual. WOW). Almost everything is on the boat, so I began trying to move from our duffel's to the locker in our berth. A few more errands and then microwave dinners (yes, we have a microwave & it works but probably won't get used much because it draws so much power). Captain also determined the freezer works quite well by making ziploc bag ice, so he was rewarded today with ice cream! (Fridge quits working--Captain frantically cleaning the strainer to save the ice cream.) New first mate duties: wipe off solar panels daily, maintenance log, container consultant. Calm water night but still chilly. Day 6 (Monday): A beautiful sunny day in the 60's. Captain finds the reefing line diagram in the PDQ manual, so he goes out and plays with reefing line some more. 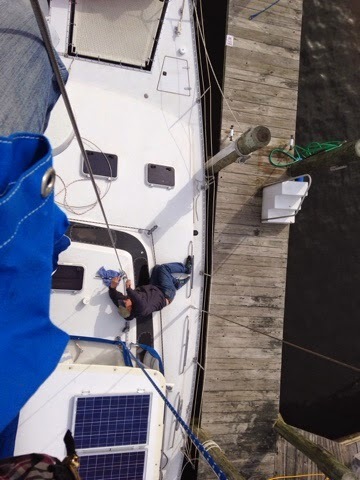 Back up the mast to change out the upper stays. Then he spends the afternoon tinkering with the baby stay. I do more errands. I think I'm officially sick of Target. I give up and order from Amazon and have it shipped to our broker. I'm also now the mooch at Starbucks, buying a Frappucino for free wifi & an electrical outlet. I clean out a few more cabinets and the Captain decided to go outboard shopping at the BIG West Marine. It's like Disney for boaters. I was walking around in a $260 Helly Hansen foul weather gear jacket and no one even looked twice. 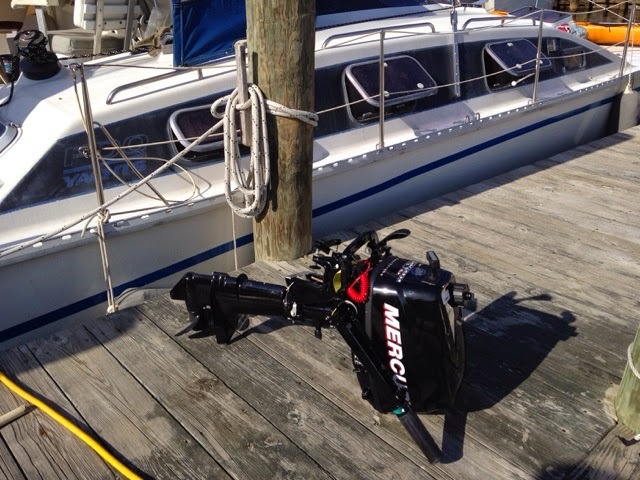 We buy a new outboard on sale and fight over who gets to drive first. For once, we are clean and presentable enough at the end of day to use our Brio gift card for dinner. A good day.